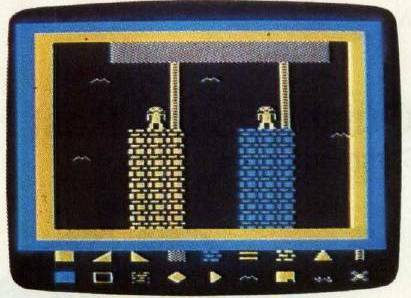 Construct screen art on the Atari with a joystick and basic shapes formed by redefining characters. You also can save a picture to disk or tape for later viewing. The Commodore 64 version, called "Hi-Res Graphics Editor," employs sprites to transport and transform even the most intricate designs. "Picture Perfect" is not a game that pits you against the computer, but instead is a way to create pictures, patterns, and designs by using the computer and your imagination. Type in the listing and SAVE a copy, making sure that line 1520 is exactly as shown. When you run the program, you will be prompted for the filename to be used later when saving or loading your picture file. Tape users should enter C: for the filename. Disk users can enter any legal filename, but it must be prefixed with D:. Once you have selected a valid filename, a picture of a castle will be displayed. Press START, and two rows of nine shapes will appear at the bottom of the screen, below the drawing area. Touch the OPTION key to see two new rows of shapes, and touch OPTION again to toggle back to the first two rows of shapes. These are redefined characters, to be used in your drawings. A question mark will blink on top of the shape to indicate your position. Using a joystick plugged into port 1, you can move across the two rows of redesigned shapes. To pick up one of the shapes, stop on top of it and touch the joystick button. The question mark will then move to the upper right corner of the drawing screen. You can now place the redesigned shape anywhere on the screen by touching the joystick button. When you want another redesigned shape, touch the SELECT key. This places your cursor on the two rows of shapes so you can pick up another design. To erase a shape, move the question mark on top of it and touch the space bar. Should you want to erase a large portion of a picture, touch the E key. A red E will replace the question mark on the screen. By holding down on the joystick button and moving the red E, you will be able to quickly erase a large portion of the screen. To stop erasing, simply press the E key again. If you want to erase the whole screen, touch the CLEAR key. To store a picture on tape, first place a tape in the recorder or your disk in the drive and press PLAY and RECORD, then touch the S key on the keyboard. The program will save the picture on tape for you. When using tape, be sure that you press PLAY and RECORD before you touch the S key No RETURN is necessary and the saving will start immediately. To save a picture to disk, first insert the disk in the drive and close the door. Then touch the S key. If you have a picture already stored on a tape or disk and want to load it into the program, you need to have Picture Perfect in the computer. Place your tape into the recorder (or the disk into the disk drive), press PLAY (for cassette) then touch the L key. When the picture is loaded, it will be displayed. Once again, be sure that your tape is ready and that you have the PLAY button pressed before you touch the L key.